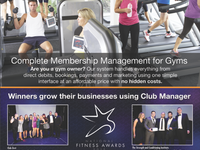 ClubManager is an affordable, award-winning membership management software giving club owners freedom to grow their businesses. Pros: Very low price. Good basic database, and sign in system. Can add own logo. Scan cards are good and the till layout is ok.
Cons: Not very flexible with various products, particularly variable price products. Doesn't link with direct debit company very well (this could be on the DD company's side). If you offer several different memberships types starts to be time consuming to keep customer's profiles up to date. Analytics is not very detailed, and can be awkward and time consuming to find information you want (eg. I want details of a selection of products, not all of them I have to scroll through and make notes then enter info in to a spreadsheet.) The same when it comes to getting membership information but for the price wouldn't expect all this. Overall: New database for customers and is easy to renew customer's membership. Thankyou for your review. We really appreciate your feedback and will take this on board. 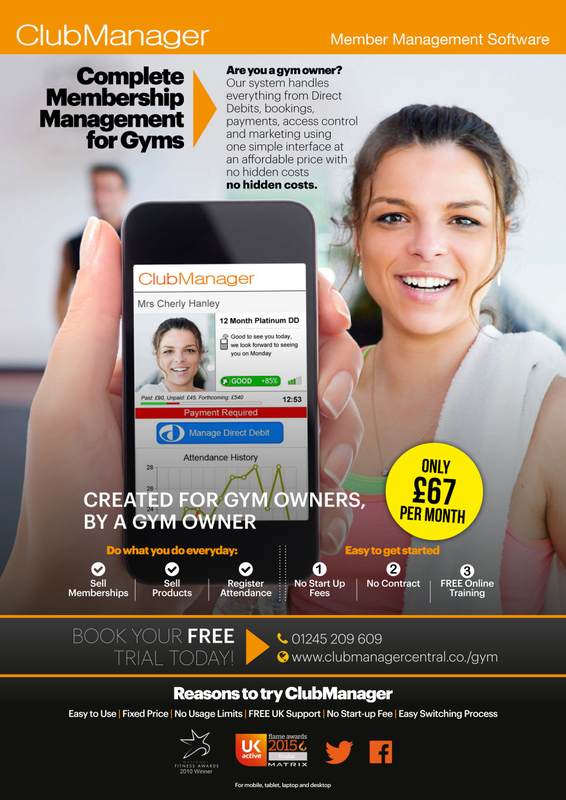 We aim to keep ClubManager at a low price for all our customers and provide them with a good quality service. are available between 9am and 5pm to answer any queries you may have. Pros: Keeps us real time up to date on all key indicators of our business from whatever platform we use anywhere! Without the introduction of Club Manager our business may well have disappeared - it revolutionised our approach and our results. Cons: Not many cons to be honest, in fact only one! - whilst the on line tutorials are good - the tutorials don't keep up to date with the latest releases. Overall: Tracking Key Business KPI's improving our prospecting and retention! Thankyou for your review. We really appreciate your kind comments and will take your feedback on board. Pros: It is a very easy to use system which means it is easy for staff training and ensuring memberships are up to date. Changes and updates are easy to imply and works well with both of our collection systems. Cons: We haven't really experienced many downsides to this system although we do not use the product for anything other than signing in members. We experienced an issues with card formatting for a while but this was quickly resolved. Thankyou for your review. We really appreciate your comments on ClubManager! Thankyou for your review, we really appreciate your kind comments and feedback! Pros: The transition from our old software to Club Manager was seamless. The Customer Support is also top class. All of our employees have marveled at the ease of use of the system. It's accounting features are a huge help to our accounting department and provide clarity and accountability for each transaction. Communication with our members is easy and can be done through many mediums. There are clear features which show each members details and the membership they have chosen. It's clarity and ease of use has not only improved the service to our members but has also helped us keep track of payments and thus improved our revenue. The cost is of extraordinary value, especially considering the amount of money it saves us each month. It is a well planned and executed software and would be an asset to any company. Thankyou for your review! We really appreciate your comments. Pros: It's simple and they even transferred all of our members over onto club manager for me, all I had to do was send them a spreadsheet with details on it. Pros: Ease of use. Linked in with GoCardless DD System. Simple booking system for customers, who have no need to contact us to query their bookings. Cons: Would like the ability to link to different bank accounts - One for the gym and one for the classes. Time out function should be able to be set by the user. Thankyou for your review! We really appreciate your comments and will take your feedback on board. Overall: The best part is the automation into our turn style. No more hours of "have they paid" or "haven't they paid"
Overall: We have had a very good experience with Clubmanager they are helpful and the software does what it says on the tin. Comments: We took on CM in 2016 to manage our database, and the system as not let us down, it has surpassed all out requirements and we still keep finding more things to integrate into our club. it manages our Membership database, monitors and takes payments through Go Cardless and Stripe. the booking module has allowed us to increase attendance at all our coached sessions, allowing members to see what's available. the pricing structure is clear, the customer support is first class, any enhancements are dealt with quickly with either a change to the system or an acknowledgment that it will be changed at the next review. CM always welcomes feedback and act upon it to enhance the system. It can't meet requirements for all but they're always looking at solutions to personalise. Couldn't wish for anything else. Thankyou for the review. We really appreciate your kind comments! Pros: That its easy to use and without any training the staff have worked out lots of ways it can be used for our youth centres. Cons: Nothing - apart from I wish we purchased it sooner. Overall: We are currently trialing at 2 of our 4 youth centres. It will replace our excel spreadsheet. We never realized how powerful the system is, it has allowed us to monitor attendance and given us many more stats on our members. It is a very powerful system! We really appreciate your kind comments and are happy to see your getting along well at the youth centres. Pros: Easy to use and set up, can create a report for pretty much any part of the business and a great way to track members and their habits. Happy with the integration with DFC as well. Cons: When looking at all members this defaults to 25 per page and resets to this every time the page refreshes, not the end of the world, but a little annoying. Thankyou for your feedback. We really appreciate your comments! Thank you for your review. We really appreciate your comments on the software. ClubManager automatically logs you out after 25 minutes to keep your data safe and for security purposes. Pros: Easy to use, intuitive, ease of accounting and readily available statistics. Cons: Some statistics conflict with one another so may not update as quickly as some others. Overall: Club Manager was extremely easy to set up. If an issue occurs a response is easily given within a few hours and it usually solves the problem. Thanks for your review! We really appreciate your kind comments. Please email us with the statistics that may not be updating you and we can get back to you on this. Comments: From the initial training session done over the telephone, I really have no negative comments to make only positive observations. From someone who is not particularly computer literate, I find the system easy to use, easy to pick up, provides all the information I require at a glance, is updated regularly to make moving around the system even easier. All in all we love it and have indeed been offered other software but we are more than happy to stay with this one. It is a one piece package that provides everything required at the press of a button. A big plus for me is being able to access the software from home and work on paperwork, stats etc from the comfort of home at times to suit myself. Kirsty! Thankyou for this lovely review, we really appreciate your feedback. Comments: I have been using Club Manager for a few months now and I have to say how impressed I am with it. It is so user friendly and you can tell it has been developed my someone who knows the gym industry. The fact that I can get it on my mobile, tablet and pc, is so handy for someone like me, as I am always on the move. Adding members is so easy and keeping an eye on the day to day running of the gym is very simple. The support team at Club Manager are always on hand to sort out any technical issues. It is by far the best system that I have ever used and I have been a gym owner for almost 7 years. Keep up the great work guys!! Thankyou for this brilliant review, we really appreciate your comments and are proud to be apart of your business! Comments: After many frustrating years using a few of the "major" software companies I moved to Club Manager because I felt they really understood what my club needed. They didn't let me down. The software is easy to use yet gives you everything you need. The tech team are fantastic and are there for you, speaking a language thats easy to understand - not tech jargon. Can't praise Club Manager enough - it has streamlined the way we run our club and cut back on admin time giving staff more time to spend on the gym floor engaging with the members. Debra, thanks for your lovely comments about ClubManager. We really appreciate your kind words and are glad to hear you are getting along well at Club Zest Ladies Leisure! Comments: We have owned our health club since 1992. Since then we have used a few different software companies to provide us a club management solution. We got let down hugely by another supplier a few years ago and were in some trouble, so we turned to Club Manager, who pulled all the stops out and got us up and running with virtually no interruption. Since we made the decision to use Club Manager we have never looked back. The support is always first class and the product is developing all the time. In my opinion, Club Manager is the best and most cost effective Club Management software available, why use anything else? Thanks Matt for your review, the team really appreciate your kind words! Intergration with other price products is not possible but other than that its affordable. Pros: It has great user interface and a well structured database .it has provided my customers with a good plan cost. Cons: It runs slow sometimes and logs me out when I have not been constantly using using it.if this is solved then perfect will it be from other software s.
Overall: It ensures membership are up to date . Pros: Easy to navigate the screens and run reports. Customer service is superb - fast to respond, helpful and able to easily correct my errors! Thankyou for your feedback we really appreciate your comments. Comments: The system I was using in my club was old and outdated. The first place I approached was club manager. I had a phone consultation with Wayne Heath and I was sold!! The system does everything i need. Accounts, purchases, sales, and if you have an issue, ring the good folks at club manager and the problem will be sorted that day! If your using like I was an old outdated system bin it now! Ring club manager and honestly you won't be disappointed! Thankyou for your kind comments the team really appreciate your review. It's lovely to hear you are getting on well at the gym dock. Thanks again. Comments: I like Club Manager a lot but there are a couple of issues I would like to improve. Sometimes the system runs slow, especially at busy evening times (class bookings etc). The support is usually good but again, sometimes slow to respond to an e-mail. Good things are on-line bookings, ability to monitor it from anywhere, and the best thing is the link to our Direct Debit company DFC. Thanks ever so much for your kind support Ruth. There could be some localised reasons why this happening. The support team will give you a call to take you through some checks to see if it's running correctly. Comments: We've had some issues with CM due to our credit system we use and still feel that what we were told the system could do for us has never materialised. However some of the recent upgrades have improved the movement around the diary etc. We still don't feel confident refunding clients as not sure how this affects credits. I am disappointed the staff list doesn't let you store phone numbers or emails, this seems pointless. Also cannot get to grips how to email a specific group to target for marketing, i.e. can I email anyone who has attended yoga to tell them about a new class?? Also, the class reminders are useful but we charge for cancelling less than 24 hours in advance so if you could select your own time frames that would be good. I find little help from the support team in general as always feel I am asking something that isn't possible. Thanks for your review Maria. You appear to have some questions that we would love to get answered for you. One of the team will be in touch to book in some update training with you. Thankyou for your review. We really appreciate you taking some time to leave us some feedback! Comments: We have recently opened up a fitness facility in Derbyshire and have found Club Manager invaluable. Linked with DFC our membership details are taken care of so we can get on with the good stuff, helping people with their health and fitness goals. The till and reporting features are very useful day to day and any issues we have had have been sorted promptly by the supports staff. Thankyou for this review, we all really appreciate your comments. It is easy to use , and easy to keep track of missed payments etc. Unfortunatly the finger print scanner does not work all the time. There is a glitch where if a payment is updated with DFC it is not automatically updated on CM and visa versa. Thanks for your kind comments Sharon. Your feedback about the fingerprint scanner has been passed to the support team to give you a call. Once again, thanks ever so much for your support. Comments: At this point - no major cons. Does everything we need it to do. Great to be able to easily communicate with support staff if needed. Love the simplicity of the product - easy to pass on information/educate new staff. Would prefer if the till application was part of the main system rather than opening up two pieces of software daily but it's nothing major. Thanks Phil for your comments, it's good to hear your getting along well! Comments: The customer service is great, they always get back with queries quckly and resolve issues promptly. The overview graphs help me get a snap shot of my gym and how it is developing. Tricia, thanks for your review. We really appreciate your kind comments and feedback. Excellent system being updated all the time! Comments: We have been using the Clubmanager system for about 4 years now, and it has enabled us to keep a much more organised database, for current and prospect members. Always improving the system we find most changes positive and easier to use. As a suggestion, perhaps filtering of members into categories in a search could be done more easily. We really appreciate your comments and feedback. Comments: Been using the software for 18 months now with success. The software in continuously developing and improving. It does exactly what we need as a smaller business with the add ons available if we needed to expand our service. Customer service is great and the cost is low. It has a great personal touch. Angela! Thanks for your lovely comments, we really appreciate them. Perfect system for my new gym. Comments: When setting up my new gym it was key to have an all singing and dancing system. 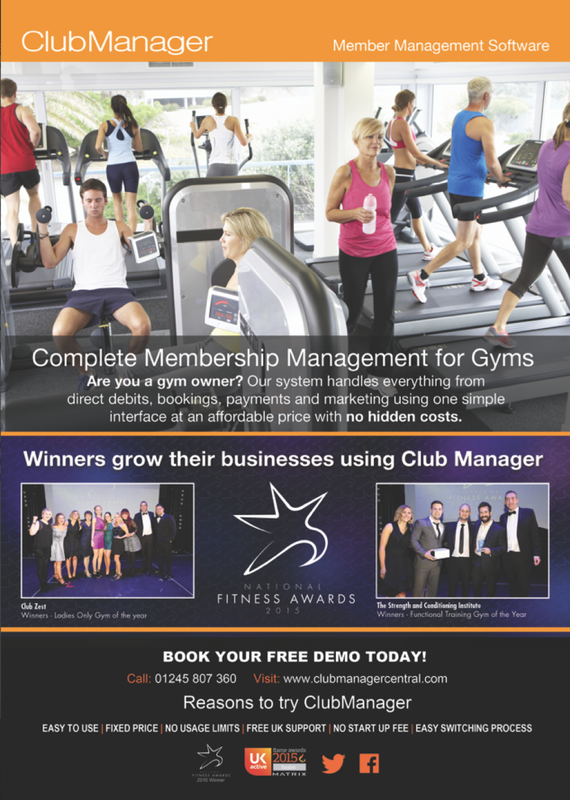 The club manager has it all; bookings, KPI's, scheduling, point of sale accounting and more. The system is so simple, my 8 year old son can work it! It has the whole package and me and the team think it's great. Lee, thanks for your review, we are really pleased to be a part of your gym! Comments: Cant delete old prospects. When someone sets up 2 memberships one for themselves and maybe another for child the first account disappears. Thankyou for your review we really appreciate your comments. I have passed this on to the support team who will be in touch with you to go over how you can do this. nice and easy to use and a great back up team behind the scences if you need any help! Comments: I joined Club Manager for ease and a competitive rate. I enjoy the product and it's easy to use for my trainers to input information. Very happy. I advise all boot camps, health clubs and sports clubs to use this software because you will benefit a lot from it. Thanks for your review as a team we really appreciate your comments, thanks again. Comments: The software development team are always updating and improving the software, they are quick to resolve any issues and always get back to you with a solution. Can't fault the software, it's helped make my business more efficient and earn more money. What more can one want? Thanks David for the review, we really appreciate it! Club Manager - Excellent all-round software! Comments: Club manager is a fantastic piece of software. The automatic reconciliation with my direct debit collections agent is superb and saves me lots of time. The updates keep improving, and I can't recommend it enough! Thanks for this review we really appreciate your comments, can't thank you enough. Comments: Just signed up to ClubManager after extensive research of options in the market. The client liaison has been excellent and the migration to the system very efficient - Looking forward to fully using the system. Thanks Peter, we really appreciate this review. Excellent system that has made my job easy! Comments: This system is so easy to use, I have had no formal training as I took over the running of a leisure club without a manager in place. I found my way around the system with total ease. Hi Penny, thanks for the lovely review! Good to hear you are getting on well at Flackley Ash Leisure Club. Steven, thanks for this review. We really appreciate your great comments! Comments: The software is overall easy to use and setup, but when problems do arise and issues and concerns become apparent the team at Club Manager are always on hand to provide excellent help and support. Leo, we really appreciate these lovely comments. Thankyou. Comments: The administrative time this software saves me is 'unmeasurable'. It has helped streamline my business and has helped change the way I run my club. Thanks for your kind review we all as a team really appreciate your feedback. Comments: Great Software, Wayne and the team are fantastic. Always updating with new ideas to suit customers needs. cant wait for them to integrate this system for multi site use! Thankyou for your review. The team really appreciate your feedback. If i have a problem customer service are always happy to help. Nicola! Thanks for your review, we really appeciate your comments. Personal trainers are excellent professionals. Pros: The software provides a friendly GUI. The distinction of categories is intuitive. The software provides customers with a good cost plan. Cons: Its software Club Manager is often slow on many occasions. Development errors are observed from time to time. Overall: I have found a lot of use in my private classes of "Salsa casino". I'm trying other software for my classes, since this one is slow. The price is accessible and also the support. 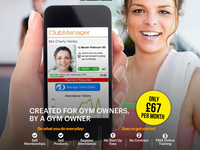 To get your account and see what ClubManager can do for you. Comments: Customer service very good, always there to help. They don't mind how many times I ring or email to query. Very helpful. Trudy, thankyou very much for your kind comments we really appreciate this review! Cons: Had difficulty setting up with till & receipt printer, need it to countdown class credits and PT sessions bought in blocks, have had false notifications about membership payments. Will, thanks for your feedback. We would very much like to undertsand more about your query so that we can get this resolved. One of the support team will be making contact with you shortly. The experience was smooth, technical support to problems was consistent and quick. Pros: It is easy to use, it has a commendable customization and it also offers quick solutions to any technical difficulty. Cons: It can be challenging to use when new features are added and there is room for further development of the software. We will be getting in touch with you to solve this.